A marine necklace, Piscean, divine! waves in the gems and the links with luminous rainbow fluorites. Ideal for romantic Piscean girls and for those who need to highlight the element water. 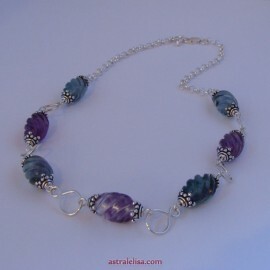 The Piscean Fluorite necklace combines carved rainbow fluorites, 1/10 silver-filled and silver-plated; approximate length is 17.5 inches (~ 44.45 cms).